Moving the Needle: Jim Thome sets up the ninth inning comeback, +.274 WPA. After suffering a humiliating defeat on Monday, the Twins got right back on the horse Tuesday and actually took a lead in the second. But the Rangers assaulted them with five runs in the fourth. 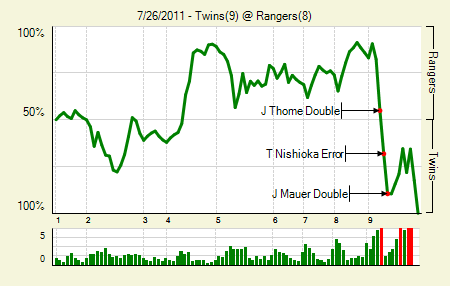 By the ninth it was 8-7 Rangers, but the Twins still had some fight. With a man on first and one out Thome hit one deep, but in the park, to left. Josh Hamilton appeared to have simply missed it. That put runners on second and third. The tying run scored when Elvis Andrus couldn’t field a bouncer in the middle of the infield, and then the go-ahead run scored on a Joe Mauer double. Joe Nathan didn’t make the save easy, but he did strike out the final two batters of the game. Nelson Cruz: 3 for 3, 2 2B, 1 BB, 1 HBP. He drove in two and scored three times on his perfect night. Michael Cuddyer: 2 for 5, 1 2B, 1 BB. His wOBA is up over .370 now. It would seem like a good time to trade him, since the Twins could probably get a decent amount of value. Moving the Needle: Mike Aviles shows why he is not a first baseman, -.234 WPA. Believe it or not, the Royals actually led for a couple of innings. 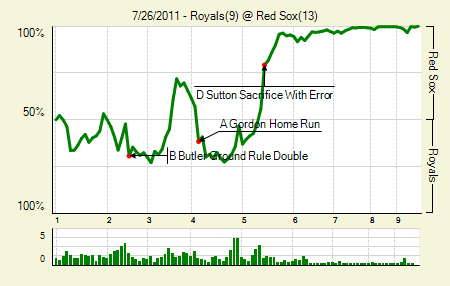 They went up 7-5 when Alex Gordon and Billy Butler homered in the fourth, and it was 7-6 heading into the fifth. Nathan Adcock got into some trouble quickly, allowing singles to the first three batters. Drew Sutton was up next, and he laid down a pretty standard sac bunt. Adcock fielded and fired to Aviles, who was covering first, but Aviles kinda just missed it. The ball rolled away, and then when he tried to fire home he airmailed it. The Sox took the lead, and then made the Royals pay for their silly mistake by bringing home four more in the inning. Dustin Pedroia: 4 for 5, 1 2B, 1 3B, 1 BB. He scored three times. How well is this guy hitting? He batted cleanup in this one. David Ortiz: 4 for 5, 3 2B, 1 BB. He drove in five runs, easily tops on the team. These guys are a big reason why the Red Sox can overcome their starting rotation woes. 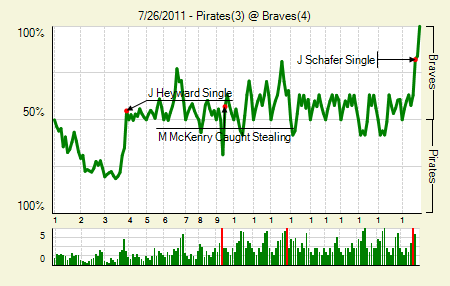 Moving the Needle: Michael McKenry gets left out to dry on a squeeze play, -.257 WPA. On Monday night the biggest WPA swing in the Royals-Red Sox game was a botched squeeze play. On Tuesday it happened again, this time in Atlanta. The difference this time is that instead of the batter missing a sign, the opposing team sniffed it out. The Braves pitched out, making it impossible for Xavier Paul to lay down the bunt that, in theory, would have plated McKenry as the go-ahead run. In any case, the obvious game-changer here was home plate ump Jerry Meals’s blown call in the 19th inning. He was wrong, and me expounding on it won’t help. I would, however, like to call out Julio Lugo in this one. “I didn’t feel the tag. He made the right call. I got in there.” That’s a downright insulting lie there, Julio. Michael McKenry: 3 for 7, 1 HR, 1 BB. He was in the middle of everything last night, it seems. Jason Heyward: 2 for 7, 2 BB. He drove in two runs. The Braves had 15 hits last night, none of them for extra bases. That’s quite an accomplishment in 19 innings. Cristhian Martinez: 6 IP, 2 H, 0 R, 0 BB, 6 K. That’s some mighty fine relief work there. The decision to let him keep going and bat for himself was easy, since the Braves were out of position players. 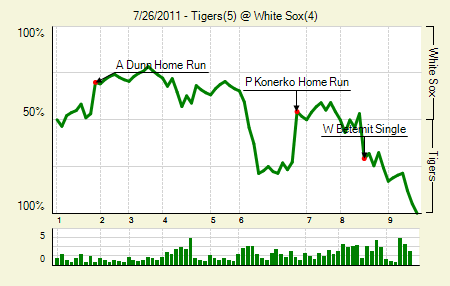 Moving the Needle: Paul Konerko homers to tie the game at four, +.270 WPA. The White Sox scored their runs on a pair of two-run homers. Konerko’s was big, as it came in the sixth and tied the game. I’d submit, though, that Adam Dunn’s first-inning two-run homer was bigger, because, well, Adam Dunn hit a homer. In any case, that was all the run scoring the Sox would do on the night. Two innings after Konerko tied it, the Tigers drew a walk and stole a base, setting up a Wilson Betemit go-ahead RBI single, which was the second biggest WPA swing of the game. Miguel Cabrera: 2 for 4. He drove in the first two Tigers runs, tying the game with the second. Paul Konerko: 2 for 4, 1 2B, 1 HR. He was the clear offensive standout in this one. Moving the Needle: Joey Votto homers to give the Reds a lead in the fifth, +.244 WPA. The Mets got some runs in the first and the third, in both instances the beneficiaries of an error and a sac fly. 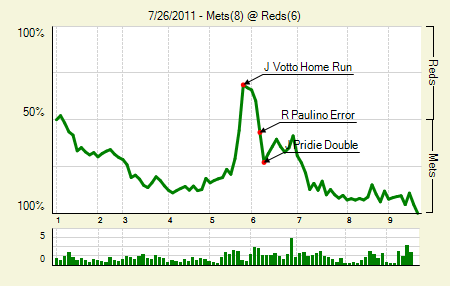 The Reds mounted a comeback after that, scoring one in the fourth before four in the fifth, the climax coming when Votto took Jonathon Niese oppo (first and only time, I swear). But the Mets came right back, scoring four in the next two innings on their way to a W.
David Wright: 2 for 5 and Daniel Murphy: 3 for 4. They combined to drive in three. Standard programming note: Johnny Cueto allowed six runs in five innings, but his ERA went from 1.98 to 1.79. Yep. None were earned. Moving the Needle: Matt LaPorta grounds into a double play with the bases loaded, -.500 WPA. At first LaPorta was the hero, smacking a homer in the seventh to put the Indians to within one. 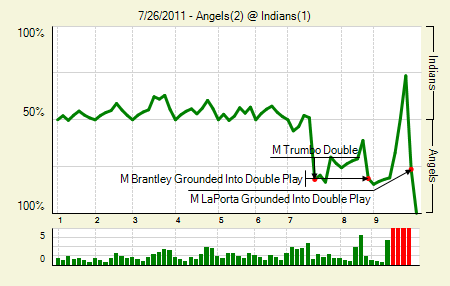 In the ninth the Indians started a rally to make up that other run. Two singles opened the inning, and then Lonnie Chisenhall reached when he tried to sacrifice the runners. That brought LaPorta to the plate, but this time he did not come through, grounding one to second. Kendrick went home with it and then Jeff Mathis went to first. Before that the Indians had a 73.5% chance of winning the game. Jason Kipnis did have a chance to win it with a single, but he struck out to end it. Jered Weaver: 7 IP, 5 H, 1 R, 2 BB, 5 K. Back in mid-May he had two straight appearances with 6 IP, and 4 R. Since then he’s allowed three runs twice, two runs once, one run six times, and no runs three times. Josh Tomlin: 8 IP, 4 H, 2 R, 1 BB, 3 K. Now that he’s back to being ho hum I’m finding it harder to say things about him. 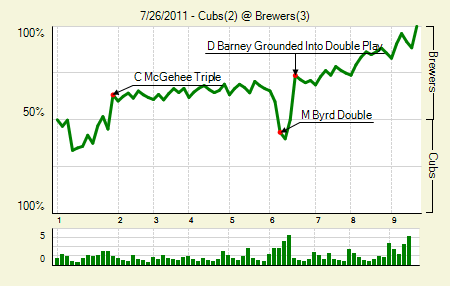 Moving the Needle: Darwin Barney grounds into a double play to end the threat in the sixth, -.237 WPA. Both the Cubs and Brewers expended the bulk of their offensive efforts in the first, the Cubs opening with a pair and the Brewers answering with three. There were a few threats, but none as great as the Cubs in the sixth, when they loaded the bases with none out. 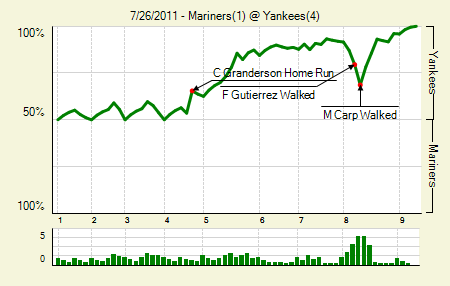 Alfonso Soriano grounded to third, which led to the lead runner getting cut down, but they still had two more chances. That is, until Barney hit a sharper grounder to third, which went around the horn for an inning-ending double play. The cubs got a couple of base runners from there on, but didn’t really threaten. Ryan Braun: 3 for 4, 1 2B. He’s 11 for 23 with two doubles and four homers during his current six-game hit streak. Aramis Ramirez: 1 for 4, 1 HR. He drove in both Cubs runs. Moving the Needle: Curtis Granderson homers for the first run of the game, +.119 WPA. Coming into the game Curtis Granderson had 27 homers, all of them to right field. Last night he hit his first of the season to left, a shot that just cleared the wall at the corner. That made it 1-0 Yanks. They jumped out to a 3-0 lead eventually, which was more than enough for the pitching staff. CC Sabathia: 7 IP, 1 H, 1 R, 3 BB, 14 K. He came back after two rain delays. After the first he was fine, but after the second he came out and walked the bases loaded. One of those runners ended up scoring. Have to wonder what would have been without the rains; he was perfect through 6.1. Mark Teixeira: 2 for 4, 1 HR. After going homerless for the first 21 days of July, he’s hit three in the last five. 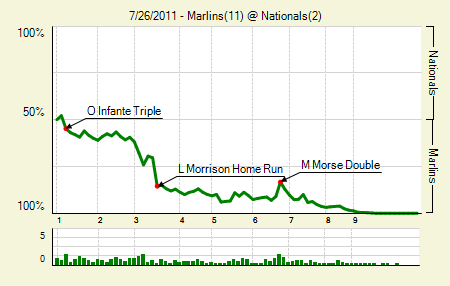 Moving the Needle: Logan Morrison’s homer puts the Marlins up big, +.152 WPA. The Marlins opened up the third with a double and a single, but then Greg Dobbs emptied the bases with a double play, though a run did score. After a hit by pitch, Morrison got a cookie and demolished it, giving the Marlins a 4-0 lead. Greg Dobbs: 3 for 5, 1 HR. He drove in five — and remember, he didn’t get an RBI for the above-described double play. Emilio Bonifacio and Omar Infante: both 2 for 4. Bonifacio doubled and Infante tripled and walked. They both also scored two runs, thanks to Dobbs, Hanley Ramirez, and Morrison. 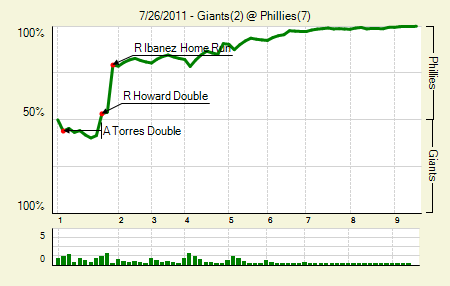 Moving the Needle: Raul Ibanez’s three-run shot in the first opens up a lead, +.251 WPA. Neither team could wait to get on the board last night. The Giants got one with a double, a ground out, and a sac fly, but the Phillies went to town with extra base hits in the bottom of the inning. Ryan Howard lined an RBI double down the right field line, and two batters later Raul Ibanez went way deep to right, giving the Phillies a 4-1 lead. Vance Worley: 9 IP, 3 H, 2 R, 1 BB, 5 K. He’s played the understudy to Roy Oswalt about as well as anyone could have. Oh, and Chase Utley hit an interesting inside the park homer. Moving the Needle: Adam Lind’s three-run homer cuts the lead to one, +.208 WPA. 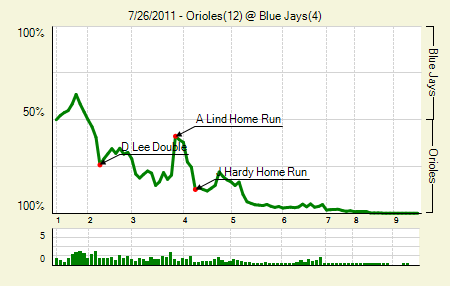 The Orioles jumped ahead early, scoring four in the first thee innings. The Blue Jays made a quick comeback attempt in the third, getting a single before Jose Bautista got plunked in the head. Lind exacted his revenge by hammering a pitch over the wall in left-center to bring the Jays close. The Orioles responded in kind, getting three of their own, on two homers, in the next inning before nailing it down in the fifth. Derrek Lee: 4 for 5, 1 2B, 1 HR. He drove in five, including three in the first three innings. J.J. Hardy: 2 for 5, 2 HR. He drove home four, including one on a sac fly. 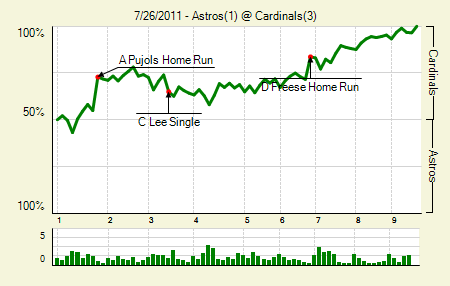 Moving the Needle: Albert Pujols gets things started with a first-inning homer, +.180 WPA. The ball bounced right back to Michael Bourn, so it wasn’t immediately lear that Pujols’s first run shot actually cleared the wall. But the umps signaled homer, though they obliged when Brad Mills asked for a replay. But it was a homer indeed, giving the Cards an early 2-0 lead. Jake Westbrook: 6 IP, 7 H, 1 R, 1 BB, 3 K. The Cardinals rotation is pitching well enough heading into the deadline, but they can’t let that fool them. They could still use another starter to add some depth. Moving the Needle: B.J. Upton grounds into a double play in the fourth, -.096 WPA. This seemed like a pretty ho-hum ground ball double play. 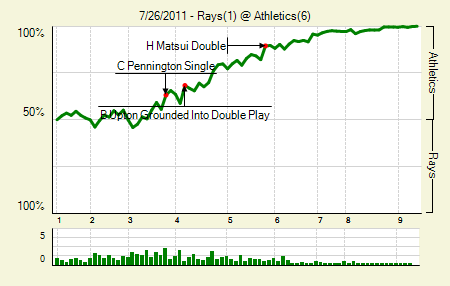 The Rays had a man on first with none out in the fourth, down 1-0. Upton hit into a 6-4-3 double play, which is something we see all the time (though not necessarily from Upton). But when the winning team scores its first two runs on sac flies, we tend to see some odd plays make the top. Brandon McCarthy: 8 IP, 6 H, 1 R, 2 BB, 3 K. I haven’t heard his name mentioned in trade talks, though a team with pitching needs could certainly take a flyer. My only concern is that the Coliseum is aiding his performance more than one might expect. Scott Sizemore: 1 for 1, 3 BB. He scored three runs thanks to that patience. 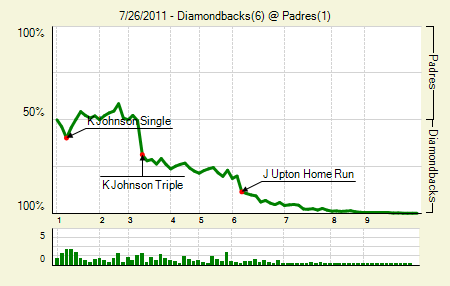 Moving the Needle: Kelly Johnson’s triple gives the DBacks their first run, +.182 WPA. After threatening but not scoring in the first, the Diamondbacks took the lead in the third when Johnson hit a one-out triple into the right-center field gap. That put him in position to score on a sac fly, making it 2-0 Diamondbacks. They’d tack on later in the game, but they were pretty well taken care of in this one. Joe Saunders: 9 IP, 6 H, 1 R, 1 BB, 4 K. He’s in the midst of a pretty good stretch right now, with a 2.54 ERA in his last 46 innings (seven starts). Justin Upton: 1 for 3, 1 HR, 1 BB. He drove in Johnson with a sac fly as well, giving him 2 RBI on the day. 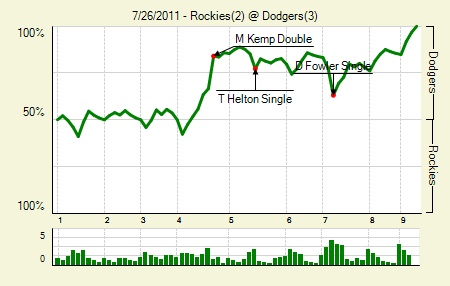 Moving the Needle: Matt Kemp doubles home the first two runs, +.174 WPA. That’s just something Kemp’s going to do with men on base. With runners on first and second with none out in the fourth he hit one into the gap, bringing them both around to give the Dodgers a 2-0 lead. He later scored on a sac fly that wasn’t at all deep, but was facilitated by Mark Ellis, who made the catch, tripping over the right fielder Ryan Spilbourghs. Clayton Kershaw: 6.2 IP, 8 H, 2 R, 2 BB, 6 K. That’s a ho hum start for Kershaw these days. We hoped you liked reading The Morning After: Game Recaps for July 26th by Joe Pawlikowski! I had to click Cristhian Martinez’s link just to double-check that’s how his name is actually spelled. Do his parents have a lisp or something?